Police took the man for a hospital check-up after finding him at Victoria Quay in Edinburgh. A naked man was picked up by police after going for an early morning swim in Edinburgh. 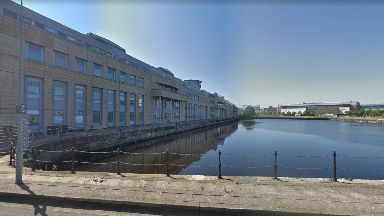 Officers were called to the car park of the nearby Scottish Government building in Leith at around 5.35am on Thursday following a report of concern for the 'skinny dipper'. After admitting to police he had gone for a swim, he was then taken to hospital for a check-up. As no crime was reported, he was later released with no further action taken. A Police Scotland spokesperson said: "At around 5.35am on Thursday, March 14, police in Edinburgh received a report of a concern for a person after a naked man was seen in the car park area of a building in Pacific Quay. "The man was traced and confirmed he had been for a swim. He was taken to hospital as a precaution and then released. "No crime was reported and no further police action is required."